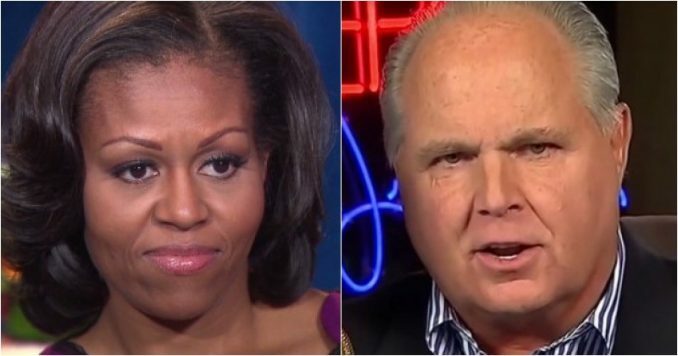 Michelle Obama has a secret dream to get back to the White House, and Rush Limbaugh just shocked the Obama camp yesterday when he exposed the entire plan. In fact, the conservative firebrand busted the former first lady’s secret dream wide open as he declared Barack and Michelle never had any intention of leaving Washington, D.C. You don’t want to miss this. Barack Obama simply cannot believe that Americans voted for a president who would destroy his progressive legacy. Neither can Michelle. And the last two years have been a living hell for the former first couple as they had to witness President Donald Trump dismantle Barack’s regulations and Michelle’s beloved school food program. It’s almost like the Obamas were never in the White House. Even though Michelle has sworn she will not run for president, Rush Limbaugh says that’s all a rouse. Limbaugh on his show Thursday cited a headline about Obama quietly coaching 2020 Democratic candidates. “Do you remember when I said when I predicted Obama would not be leaving Washington, that he would be hanging around and that whenever anything. … No matter who won, but especially if a Republican won,” Limbaugh said. Then, the radio icon dropped a bomb on the Obama camp. He is not sold on Barack being satisfied just helping out potential candidates. He senses something else is going on. Limbaugh went on to make the point that Michelle’s big book tour looks an awful lot like what presidential candidates do before they run for president. And Rush Limbaugh isn’t the only one who is indicating Michelle Obama will be running. In fact, Rush doesn’t make predictions like this unless he has some inside information. The 68-year-old Trump supporter also pointed out the New York Times article about Obama, which he said confirms his instincts. Well, it’s no surprise to us Trump supporters. And if Barack and Michelle feel the need to take on Trump head on, we say bring it on. The president could point to Obama’s bleak economic record, his failed foreign policy, his dismantling our military and then ask Americans if we want to go back to those dreadful days. Michelle may be popular with Democrats, but that was as a first lady. She has zero experience in leading any business, and she has never held any office. The Democrats claimed Trump had no experience, yet he was the CEO of a billion-dollar organization he built. What’s Michelle going to run on? Her White House vegetable garden? That disastrous school lunch program? Barack can’t stand that Trump has erased his legacy, and running Michelle for president isn’t going to make him the first dude. It will just get President Trump re-elected.